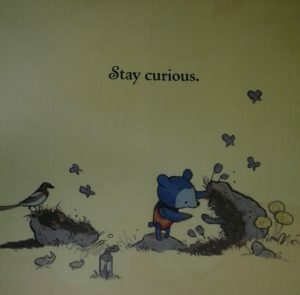 Elbert, the Curious Clock Tower Bear has this cover that makes you want to pick it up and look at it. This softly colored book (either representing dawn or dusk) is lovely. It is covered in pinks, purples and even canary yellow. Even the dark green, gray and blue are cozy and comfortable. This has the art (for me) being the strongest part of the book. The text, while there is a good story, and is full of details and the story is an interesting moral, is almost not needed. The art tells its own story. With that said, Andrew Prahin also created a story worth reading. While, it might take a couple reads to get everything out of it (the text and art), it is also still fairly straight forward: a clock tower bear does not go with the flow, he stops and stares at things around him, is curious and because of this, literally trips up the other bears of the clock. These bears think that curiosity is a bad thing and must be gotten rid of. And while our little hero wants to fit in, there are too many curiosities to check out. What is a poor bear to do? This story has an old school feel. Perhaps that is due to the illustrations showing what looks to be a German or Scandinavian inspired village and, of course, the clock. Yet, the way it is presented is a very modern take on being different, being curious and stop and smell the cookies. Share the post "Stay curious my friend"